Let’s start with the dough. Heat the milk, 1/2 cup sugar, salt, and margarine in a small saucepan over low heat until the margarine is melted. Remove from heat and add vanilla. Set aside and let cool while you place the warm water (approx. 115 degrees), 1 TBSP sugar, and yeast in a measuring pitcher. Stir for a couple seconds until it’s mostly dissolved and then set aside for 10 minutes. The yeast will double in size and should at least reach the 3/4 cup line on your measuring pitcher. If it doesn’t, you’ll need to try this step again until your yeast is active. In a standing mixer, or with a hand mixer, whisk margarine mixture with the yeast and beat at medium speed for 2 minutes. Reduce to low speed and add 2 1/2 cups flour. Mix for about 2 minutes and then add the remaining 2 cups of flour. Beat for 1 minute. Remove dough from mixing bowl and place on a clean, lightly floured surface. The dough should be a little tacky, knead for 2 minutes with your hands. Place dough in a very large bowl sprayed with cooking spray and roll it around so it is covered (this will keep it from sticking to the bowl as it begins to rise). Cover with plastic wrap and set aside in a warm place until is has doubled in size – about 2 hours. 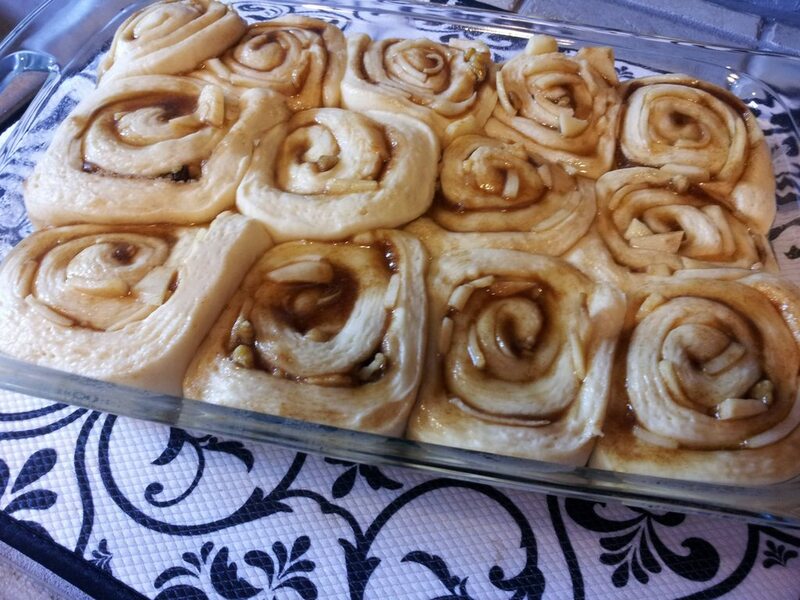 Next, prepare the apple filling while you’re waiting on your dough to rise. Simply wash, peel, core and thinly slice 2 apples. I used one green and one red to mix up the tart and sweet flavor, it worked nicely. 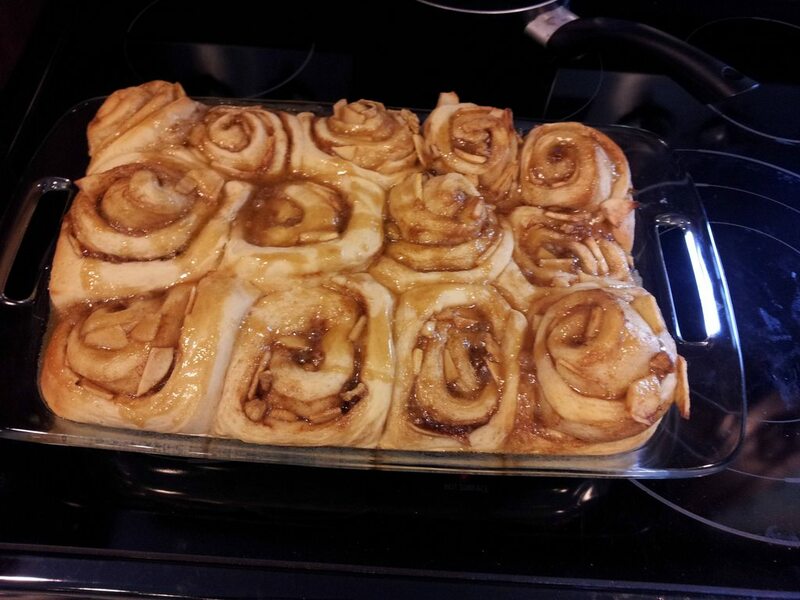 Put them in a medium sauce pan on low heat with margarine and cinnamon for 20 minutes, stirring occasionally. You should be left with semi- soft apples and a syrup like juice. You don’t want the apples to be too soft, because you’ll be baking them later. Empty into a container and let cool in the fridge for now. Make the caramel sauce next and let cool at room temp. 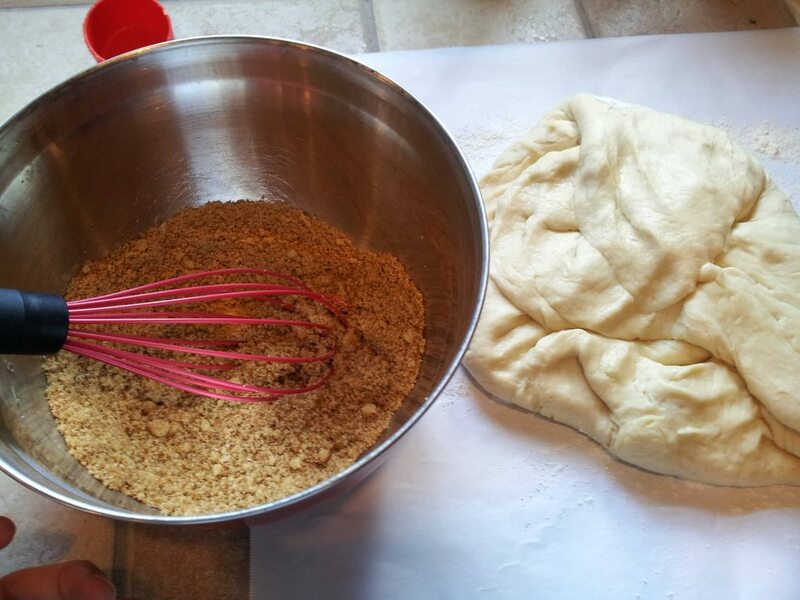 Once the dough has risen, punch in the center so that the dough deflates. Take dough out of the bowl and place on a floured surface and let rest an additional 10 minutes while you mix the filling. Thoroughly combine brown sugar, sugar, and cinnamon in a mixing bowl. Roll the dough out into approx. a 20″ x 13″ rectangle. 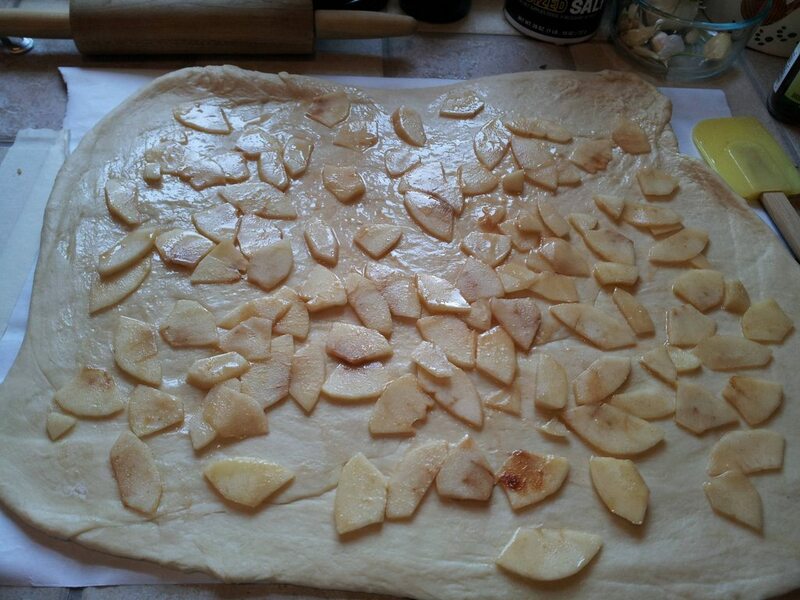 Spread apple mixture, juice and all, evenly onto the dough and press in firmly. Use a pastry brush to lightly spread melted margarine on any dry areas you may have around the edges if necessary, but don’t over-do it. Next spread on your sugar mixture and press into the dough firmly, add walnuts and press into dough firmly so nothing will fall out when you roll it up. 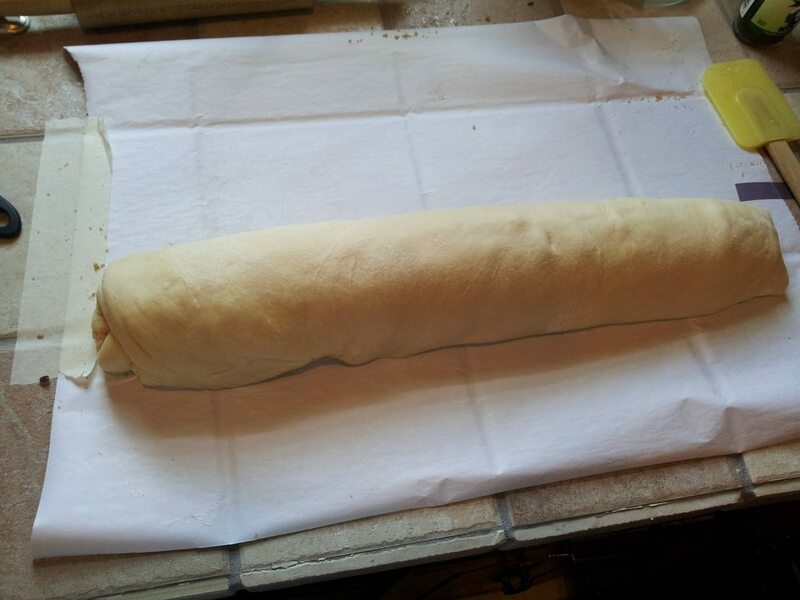 Roll the dough, tightly and carefully into a log. Cut log in half. 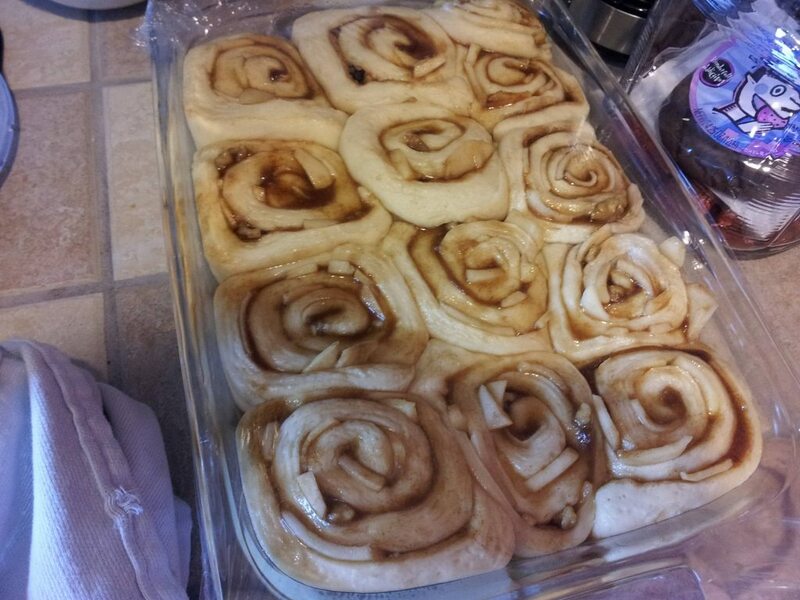 Cut each half into 6 rolls and place in a lightly greased 9 x 13 ” baking dish. Cover with plastic wrap and let rise in a warm place for at least 1 more hour. Heat oven to 375 and bake for 20 minutes, uncovered. 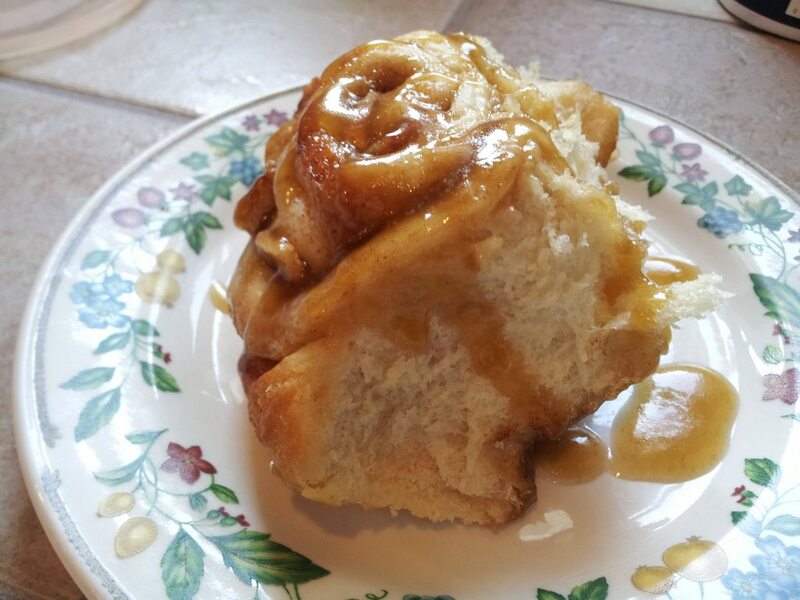 After 20 minutes in the oven at 375, remove and drizzle a few TBSP of caramel sauce over the buns and return to oven for another 10 minutes, keeping a close eye on the tops of the buns. After 10 minutes, remove and cover with foil. Bake for up to 10 more minutes, or until the dough on top is soft, but not raw, if you see any raw dough, return to the oven in 5 minute intervals with the foil on top to prevent burning. Drizzle over more caramel sauce until it’s right for you. I ended up only using about 1/2 of the caramel for the buns, and used the other half for some chocolate covered caramel pretzels. You can store these in an air tight container at room temp for up to 3 days. Pingback: タカショー　「クイックシェードキャノピー」　＜モカ＞　?幅2m×高さ2.8m?